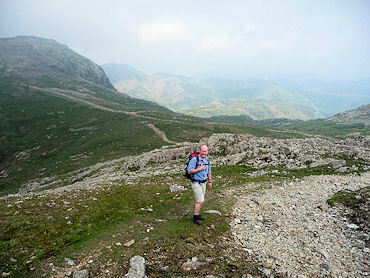 The Walk: My friend Neal Lever and I had been building up to a long, full day walk and decided to tackle the Scafells from the Langdale valley. 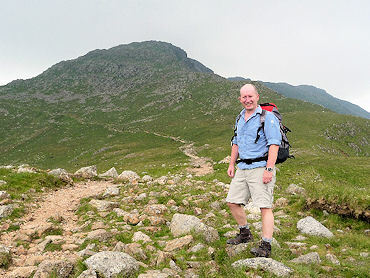 We knew this starting point well having already done Crinkle Crags, Bowfell, Pavey Ark etc, so we felt comfortable with it. The only nagging issue was to try and find a route which as not just out and back, so we added a return via Cam Spout and across Great Moss - little did we know how knackered we would be at this point ! We left the car park near the New Dungeon Ghyll at 7:15am and it was hot, windless and stuffy - not a really good sign as we had a long day ahead. As we climbed the first section of the Band we were seriously wondering whether we had enough water. We aimed for the single rock near the top of the Band which leads to a fairly indistinct path to the Climbers Traverse. This was the first highlight of a memorable day. This is a stunning path, quite narrow and perhaps a bit dodgy in poor weather. By now we were enjoying the cooler air and the edge had been taken off the heat. The sense of isolation and being dwarfed by the huge cliffs was wonderful and we could have happily stayed there all day. 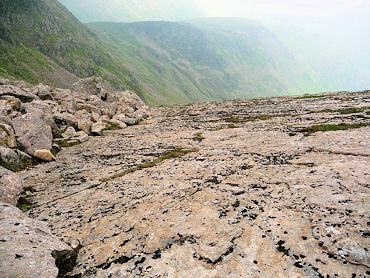 At the end of the Climbers Traverse, we scrambled up the the Great Slab which was a much longer climb than we thought. It was bone dry and no problem at all to walk up the 30 degree slope. 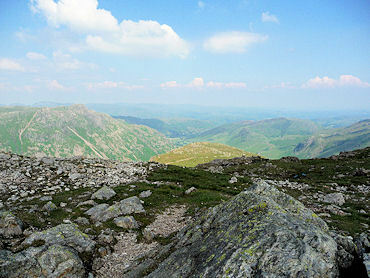 I wouldn't fancy it in damp weather though as it would make a damn fine ski slope ...... After a quick last ascent to the summit of Bowfell, we had a time check - 9.00am - and all was well with the world. This is my favourite mountain of all. Majestic, a proper peak, tucked away yet in the middle of an amazing vista. Today however, the views were not brilliant as a persistent wispy cloud cover was hanging around. Not to worry, it would soon be burnt off by the sun. Getting down from Bowfell is always a bit of a rock fest, but we picked our way down to Ore Gap an the headed more or less straight on and flew up Esk Pike. 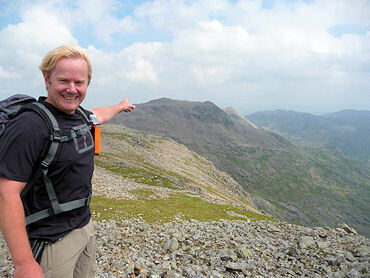 A quick map check on the summit told us we were bang on track. Looking back at Bowfell gave another view of this majestic mountain and we were surprised how quickly we had come down it. From Esk Pike we could see the junction of Esk Hause and the path leading up to the Scafells with a few people dotted here and there. So far, we hadn't seen a soul. The route down from Esk Pike was a delight with sharp escarpments, narrow slabs and stunning views of the Scafells now starting to appear from the thinning cloud. The path from Esk Hause is wide, clear and very easy, but this soon changes as you get near Great End. Now the way is full of boulders and it is a case of picking your way across the tops of boulder fields spotting cairns here and there. Again, in today's warm and clear conditions it was no problem, but it must be a hellish place to be in foul weather - it is a brutal place. After a few false summits and a gruelling descent and re-ascent, we hit the final climb to Scafell Pike and soon enough we were there - the highest point in England. A quick reckkie at the very top and then we found a quieter place to reflect, rest and have our lunch. There were a lot of people at the summit, most seeming to come from the Wasdale route and really a few too many to say this was an enjoyable place, but the ruggedness and grandeur of the place is spectacular and full credit to anyone, whichever way they came up, for making it to the top. 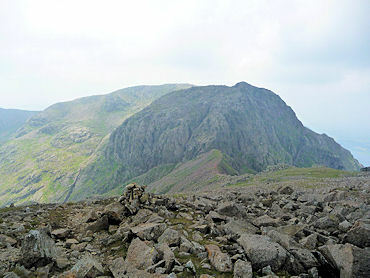 As we rested, our eyes were drawn to the next challenge - Lords Rake and Scafell. Neal had been going on about Lords Rake for a while and I thought it might have been shut due to the possible rock falls. We agreed to go down and have a look and then decide. The view across to Scafell is simply one of the most stunning vistas I have seen - no beauty here, just a massive wall of crags dwarfing the few climbers you could see. 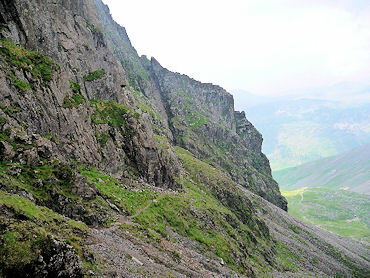 Mickledore is the place of legends, a narrow but safe link between the two highest points in England. Steep drops on each side suggest other routes up and down, each turn provides a gasp as you can see what feels like miles down into separate valleys. 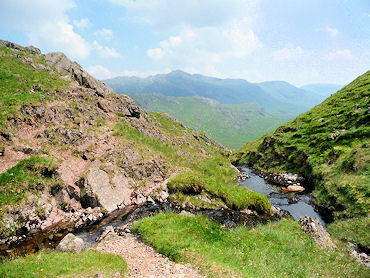 The two options we had in mind were clearly visible - Lords Rake to the left and Foxes Tarn Gill to the left. Fortunately we had prepared well and knew each route involved a steep drop down before rising again. 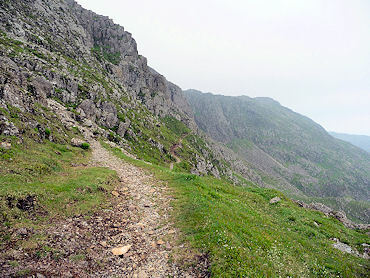 We got to the end of Mickledore and found a very steep, scree filled path down beneath the huge crags. This was a proper scramble down and at one point we had to almost run and jump across a couple of gulleys - great fun ! Seeing the climbers packs on the narrow path and hearing them above us was a bit spooky ....... this was a proper climbers traverse and I wondered if we were going out of our depth. 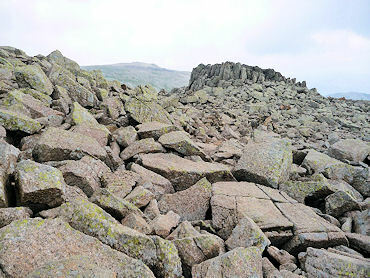 Not to worry, Lords Rake came into view and like a lot of these scrambles (such as Jacks Rake) they look a lot worse than they actually are. 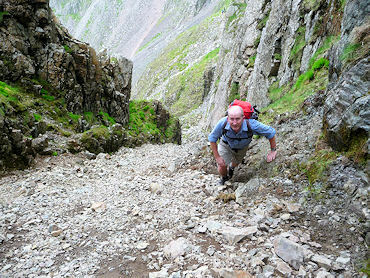 We found it great fun going up Lords Rake, no problem at all and no fears that anything was about to tumble down. 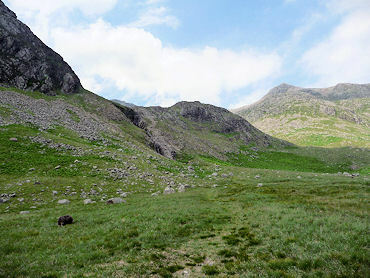 I am glad we checked the Wainwright though as it mentions there are three ups and two downs on Lords Rake and sure enough, this roller coaster of a route was a delight with amazing views to our right across to Lingmell and Yewbarrow. 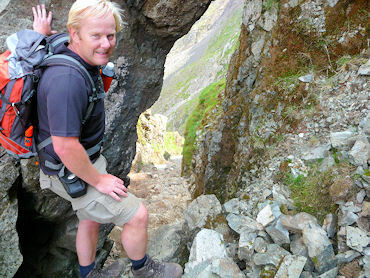 Popping out of Lords Rake, you are rewarded with the awesome view of Wast Water. Again, we could quite easily have settled down here and sat for hours. A steep pull up to the top of Scafell took us to a summit we were much more comfortable with - hardly any people except a few lads who shouted across "How bloody fantastic is this !!!" - obviously thrilled and delighted to be up there. Looking back across to Scafell Pike and you could see the numbers growing, their outlines like penguins on a rock. Now it was time to head back for the car without re-tracing our steps. Looking across to our route, we could make out Bowfell quite easily, but then we had to get over or round another ridge in between. We could more or less see where we had to go and it looked a hell of a trek. We were chatting to some people on the summit and they asked where we were headed and when we told them, they couldn't believe it .... it really looked as though we had to walk to another country. We were tired at this point as the ascent had been arduous, not helped by the hot weather and, to be frank, we were not looking forward to the return. 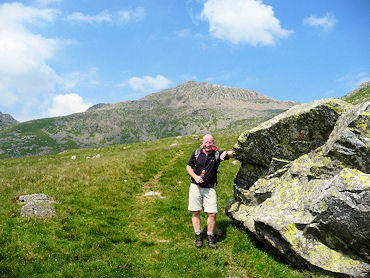 Our route down Foxes Tarn Gulley had been planned and all I can say is that I am glad we did not come up that way ! It was a tricky route down and as we were feeling tired there were a couple of stumbles. A quick dab of Ibuprofen sorted that. As we were descending a loose, steep section we came across an old guy, must have been 80, slowly but surely making his way up accompanied by two ladies also in their 80's. Feeling a bit concerned about them being in such an inhospitable place, we checked if they were ok - " oh yes, don't worry about , this path is fine, no problem at all, done it loads of time before". Absolutely brilliant ! I just hope we are able to be doing that when we are 80. We had to keep looking back at them as we wound our way down. We were now following Cam Spout down to Great Moss and I guess in wetter weather this would a spectacular waterfall but today it was a gentle stream with beautiful rock pools. As we descended to Great Moss the temperature was rising again, the wind had died down and we were left with a flat mile across what can only be described as a valley where you could image dinosaurs roaming. We were the only people in sight, it was still, hot and humid, and I was knackered - this was a very quite part of the walk. Neal seemed ok with it. We knew we still had another 1000ft (at least) of climbing to do to get back to the Three Tarns for our descent home but as we started the climb from Great Moss, after trudging over between Greenhole Crags and Long Crag, I started to feel better and Neal started to feel a bit worse ! We took our time and enjoyed a totally different view again of Bowfell, mind you we had walked up it and had virtually encircled it with our route. On reaching the Three Tarns it was time to lie back on a rock and replenish fluids and think what we had accomplished. The walk down the Band and back via Stool End Farm was easy and with tired legs, dry throats and a burning sense of achievement we had a fantastic pint outside the New Dungeon Ghyll - totally and utterly spent after spending 10 hours in stunning place.